At Kilmaneen Farmhouse we have a special interest in hill walking and hiking. Kevin is an experienced walking guide and he is always happy to take groups out on the mountains and to share the exceptional beauty of this area. We provide a shuttle service for walkers (within a 5km radius) and drying facilities for wet clothes and boots. We will also prepare a packed lunch and offer tips and advice about walking in the nearby mountain ranges. We have an extensive selection of books and maps to help with the planning process. The Knockmealdowns are at our doorstep. There are many waymarked and looped walks in this range of mountains such as The East Munster Way, The Tipperary Heritage Way, St. Declan's Way, The Liam Lynch Loop, the Knockballinery Loop and many more. -The East Munster Way which in part of the coast to coast path from Dublin to Kerry seems to be the most popular and passes within just 1.5 miles or 2.5 km from Kilmaneen. -St. Declan's Way which follows the footsteps of St. Declan who made the journey from Ardmore to meet St. Patrick in Cashel. It passes within 5km of Kilmaneen where it intersects with the Munster Way near Goatenbridge. -The Tipperary Heritage Trail, which goes from The Vee to Cashel, has been developed in the last few years. There is a detailed map available for this route. This brings walkers to many heritage sites along the way and includes lots of information about these sites. 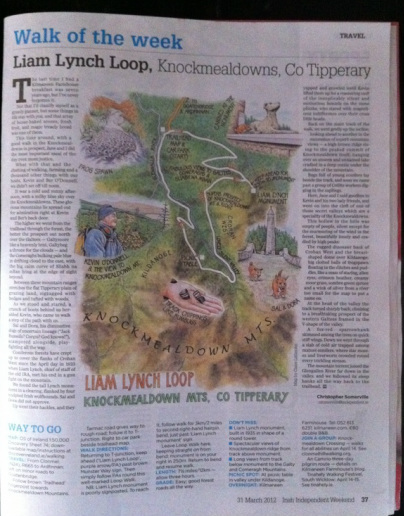 The Liam Lynch Loop is a 12km looped walk that includes the famous Liam Lynch monument that marks the spot where the IRA chief of staff was shot on April 10, 1923. 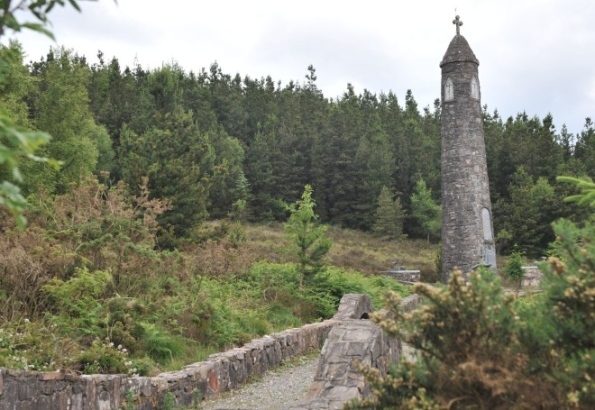 In 1935, a sixty foot high round tower, designed by Denis Doyle of Clonmel, was erected on the spot where he fell, replacing the simple wooden cross that had stood there for many years. Four cast bronze Irish Wolfhounds, created by Albert Power, guard the base of the tower and the site is accessed by two humpback bridges with sandstone parapet walls. The Knockballiniry Loop is only 6km long and it is an easy but very attractive walk through forest roadways. One of the interesting features is a lovely waterfall. 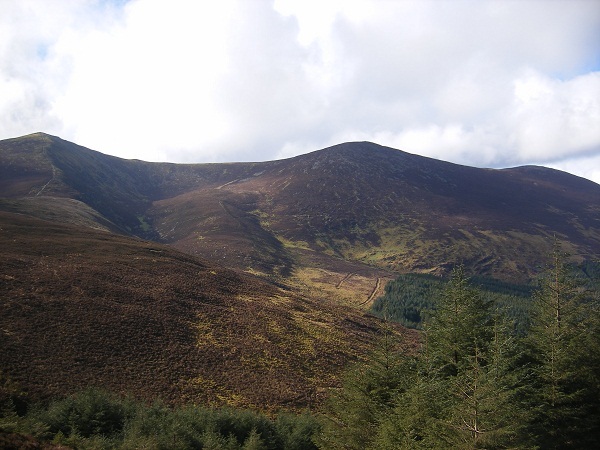 The Comeraghs are just a few miles from Kilmaneen and there is a great range of walking along ridges overlooking lakes and valleys. The Galtys are a short distance to the west of Kilmaneen and provide challenging walks for the fit and adventurous.